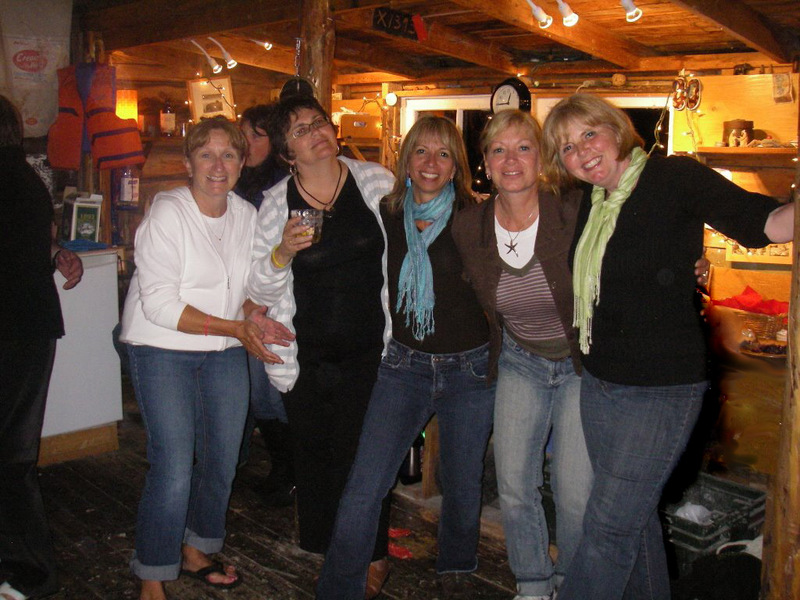 My summer time on the Rock is always divided into two legs – one reserved for my Sistas in Creativity. The original intention, many years ago, was that we would actually spend time creating. That has since been amended to the more realistic intention of merely gathering up inspiration to be used at some other point in time. This was the 5th trip for Kat and Dibs, 2nd for PB and maiden voyage for FE. Brian called right after they got there and had the nerve to say to me: “Now you let those girls relax.” Hah! Me let THEM relax? I am merely the steering wheel – they are the rudders. And if we did not put down anchor often enough, it is not merely ME to blame. We did surely cover a lot of ground. In 11 days we attended 6 concerts and a shed party, visited friends and neighbours, had a number of invitations out and had company for breakfast, dinner and candle light wine in OZ. We hiked and toured the island, went fishing and had fresh cod from the the sea almost every night. We got up early. We stayed up late. We laughed continuously and more often than most supposedly sane people, broke in song spontaneously. We had a huge repertoire, consisting of only choruses and a lot of 'dah, dah, dah' in between. In the midst of all that activity, we still squeezed in a two day excursion to Bonavista and Trinity. That was a great adventure. I hadn’t been there since 2003 and was pleased to see both towns thriving. 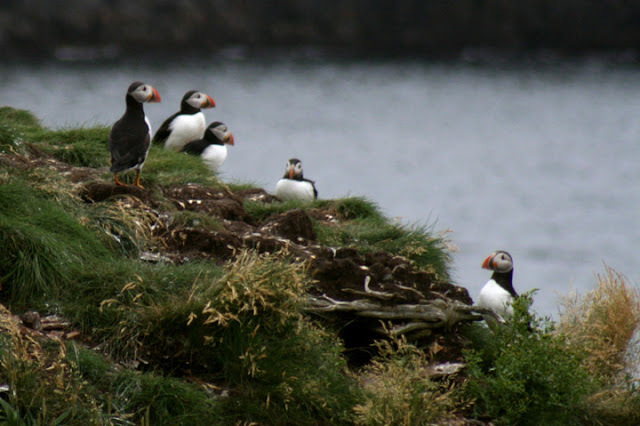 There were numerous ‘ighlights on our excursion – the first and foremost would have to be the puffins. That in fact was the reason for the mission. We were delighted with the sweet little creatures who look more like a cartoon character when they’re landing than they do a graceful bird. We saw lots of whales at the Bonavista lighthouse and enjoyed an excellent walking tour of the town. The most memorable experience though was our stay at the B&B of Albert and Florence Little. It was right beside the Ryan Premises, overlooking the replica of John Cabot’s Matthew. By chance, it had rained the previous night so the fireworks were postponed until the night we were there. We had front row center seats to the most impressive display that I have seen in years. The hosts had told us that we’d have a ‘snack’ at night, so we looked forward to tea and cookies. What we got was a huge pile of delicious crab, homemade blueberry cake and chocolate squares. We made fast friends with the four other guests in the house and by the next morning, after a huge breakfast, were hugging goodbye, feeling like we had just spent the evening with family. Besides surprising me at midnight with a lovely birthday present, the Girls gave me a gift each and every day they were there. It was so sweet … a lovely handmade pottery mug, a lavender candle, specialty tea, chocolate… thoughtful and fun things that they brought along. Their final gift was something they determined that I needed while they were there. A clock. I know exactly why they think I need a clock. When we were rushing out to get to a concert on time, I’d have to be looking for my watch – which I never wear because I don’t really want to know what time it is, or we’d be checking someone’s cell phone or the clock in the van. They thought it would definitely be more convenient to just glance up and see the time. And I know it is. But the truth is, for the most part, I don’t want to see the time out there. I don’t often care. I get up when my eyes open – I pop out of bed and the time is always a surprise when I get downstairs and find my watch. Often it’s only 4:45 am. If I knew it was that time, I’d think – ‘oh my, it’s too early to get up.’ But since I’m up anyway by that time, it’s a bonus. I stay up until I figure the day is done, which has little to do with the number on the clock. One day, a couple years ago when we were discussing whether we wanted to have lunch, the consensus was that no one felt like it. Someone checked the time and announced that it was 1 o'clock. Kat said ‘Oh ... one o’clock? I MUST be hungry!’ So we ate when two minutes earlier we didn’t need to. That’s what a time piece does to you. And that’s why I haven’t had a clock. I like the freedom of rising, eating and going to bed when the mood strikes, not when the clock dictates. And I hate to see the minutes ticking my time away out there. Tick. Tick. Tick. Each second bringing me closer to leaving that little piece of heaven. But, a gift is a gift and I acknowledged that it could be a handy thing and indeed found myself looking at it numerous times. I found a good spot to hang it where it wouldn’t be in my view unless I went specifically to look at it and still be convenient for others who might happen to need/want to know the time of day. But the house refused to accept it. I tried a number of different nails and even sharp tacks, to no avail. I hammered and hammered and hammered. One after another, the nails bent. I think that the house was protesting too … ‘No! NO!! Don’t do it!! Don’t watch the clock. I have seen too much time pass within these old walls – I don’t want to count the hours left until I'm alone again.’ I left the clock propped up against a tea pot and will buy one of those sticky things to hang it up when I return. House and I might be used to the idea by then.